Medical Case: Skin lesions over the back and buttocks. iCliniq › Medical Cases › Dermatology › Skin lesions over the back and buttocks. A 22 year old male (lives in a hostel) has back acne and some lesions below both the buttocks, both since three years. Itching is sometimes present over the back, but not on the buttocks. No allergies. Not on any medications. Some lesions are present over the inner aspect of the knees. Can this be due to a vitamin deficiency? Please share your ideas regarding treatment for this case.
? it was cystic or pus filled before ? Not used any medicines before..
not cystic or pus filled. Can you please tell diagnosis, sir? No a acne but plugged hair follicles forming black comedones, itching is common especially with heating environment as sweat cant be drained. salicylic acid washes are karotolytics , good idea, just ask pt to take bath everyday. improve hygiene and give antihistamines. I'm sorry for interrupting the conversation. Is there any problem with icliniq website? Or the app? 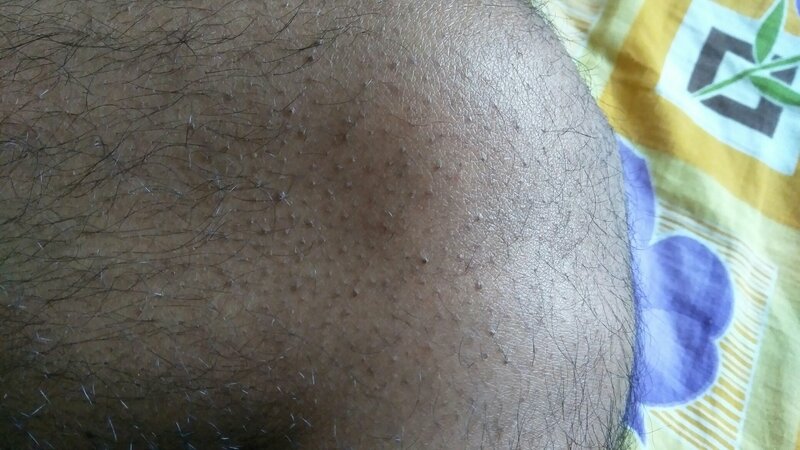 From the provided images, it appears to be Keratosis Pilaris which is often associated with xerosis and atopic eczema. The skin of the patient appears very dry, so advise moisturization along with topical retinoids. You may advise ammonium lactate lotion in 12% or salicylic acid lotion in 6% concentration.